John A. Mehos, 89, of Jersey City passed away peacefully at home on Tuesday, February 5, 2019. Born in Boston (Roxbury), Massachusetts, the second of three children to Chrysoula and Antonios Mehos. In 1936, along with parents and brother George moved to Jersey City, NJ, where a sister Eva was added to the family. A graduate of Pace University Class of 1953 with a Bachelor of Business Administration Degree he chose to be self employed operating a restaurant, the A&T Restaurant, started by his late father in 1942 that he continued to operate until September 10, 2001, a total of 59 years of operation. On the Community level, he has served the Parish Council of Evangelismos Tis Theotokou Greek Orthodox Church since 1976 serving in many executive positions including Advisor to our Youth until 1983. Served as Parish President for 16 years, 1984-1985 and 2001 until 2014. Served as a member of the Board of Trustees of the Jersey City Public Library holding the position of Treasurer for the Board of Trustees. 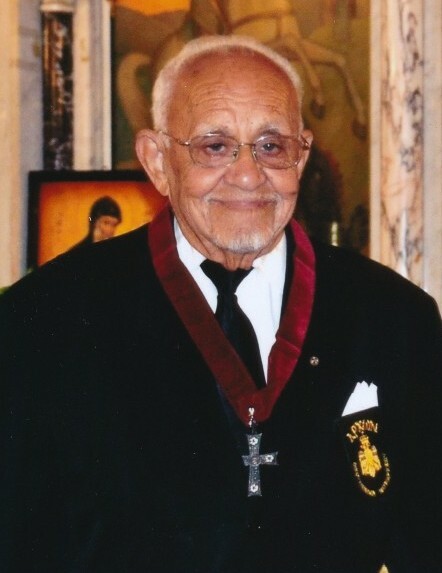 Joined the Order of Ahepa, Hudson Chapter #108 on March 22, 1966, serving in every executive position of the chapter until he was nominated to serve on the Fifth District Lodge. After serving in every position, elevated to Fifth District Governor 1988-1989, nominated and elected to serve as Supreme Governor, representing Districts 4 & 5, 1999-2000. In 2001 received the great honor to become Archon of the Ecumenical Patriarchate and the Great Church of Christ with the Offikion KASTRINSIOS, this is the highest honor bestowed upon a lay person of the Church by the Ecumenical Patriarchate. John is predeceased by his beloved parents, brother George and sister-in-law Elain and beloved sister Eva. He is survived by his beloved niece Crissy Ann Cleveland, husband Richard and grand nephews Stephan Anthony and Brandon George, also survived by many loving cousins, nieces and nephews and their families. Visitation for John will be on Sunday, February 10, 2019, 3:00pm to 8:00pm at Evangelismos Greek Orthodox Church, 661 Montgomery St., Jersey City, NJ 07306. Funeral Mass will be on Monday, February 11, 2019 at 10:30am. Interment will follow in Bay View Cemetery, Jersey City. In lieu of flowers, kindly make donations to Evangelismos Greek Orthodox Church.